Soon you will be able to see how you are going in ALL your FBE units during semester. As part of our Faculty's continuing endeavours to improve your student experience and success, FBE's vision is to release all their in-semester grades via Gradebook via eStudent over the next year. timely feedback and ongoing information about your academic performance. Should you need advice from one of our academic advisors, they will be able to provide you with better support based on your current academic standing. Viewing your results before the end of the unit will not only help you track how you're going and plan for next session. At the end of Session 2, 2013, we sent out a survey to students enrolled in the units using Gradebook. Those who completed the survey (920 students in total) were also entered into a draw to win a brand new iPad Air. 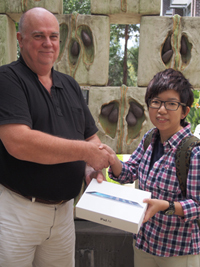 Congratulations to Hazel Suen, the lucky winner of the iPad Air! Thank you to all students who submitted feedback on their experience of Gradebook, as well as to our staff assisting with the implementation of Gradebook, for a better academic and student experience. The faculty of Business and Economics and Macquarie Sustainability are seeking 3rd year, masters or PhD students to develop case studies as part of a research project. KPMG China is continuing to invest heavily in recruitment with a strong commitment to China. For those planning a return to China or Hong Kong we are recruiting overseas graduates of all disciplines accross our core functions - Audit, Tax and Advisory. PwC is hosting a global webcast followed by an insightful panel discussion with some senior members of PwC across different lines of service. Last Updated: 2014-04-24 09:29:20 by Boris Lee.